Congrats to this year’s seminary grads! Congratulations to our Franconia Conference seminary graduates this year. 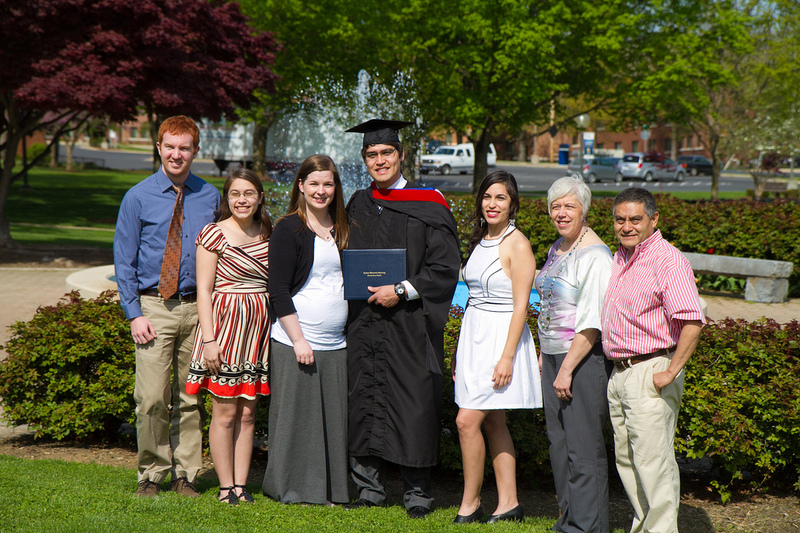 Our conference had five individuals graduate from Eastern Mennonite Seminary: Danilo Sanchez (pictured), Boyertown congregation, graduated with a Master of Divinity; Scott Hackman, Salford congregation, graduated with a Master of Arts in Church Leadership; Emily Ralph, Salford congregation, graduated with a Master of Arts in Religion; Anne Yoder, West Philadelphia congregation, graduated with a certificate in ministry; and Tom Albright, Ripple congregation, graduated with a certificate in ministry. HARRISONBURG, VA — The following Franconia Conference students were recognized as members of the dean’s list for the spring semester at Eastern Mennonite University, Harrisonburg, Va.
Madeline Clemens, a first-year business administration major from Harleysville, Pa. She is the daughter of Douglas and Rebecca Clemens and attends Blooming Glen. Hannah Clemmer, a senior psychology major from Harleysville, Pa. She is the daughter of Michael Clemmer and attends Towamencin. Jonathan Drescher-Lehman, a junior biology major from Green Lane, Pa. He is the son of Jon and Sandy Drescher-Lehman and attends Souderton. Anna Hershey, a senior biology major from Harleysville, Pa. She is the daughter of James and Brenda Hershey and attends Salford. Brianna Kauffman, a first-year accounting major from Harleysville, Pa. She is the daughter of Steven and Lisa Kauffman and attends Franconia. Laura Keppley, a senior biology and music major double-major from Boyertown, Pa. She is the daughter of Carl and Alice Keppley and attends Perkiomenville. Morgan Kratz, a sophomore social work major from Souderton, Pa. She is the daughter of Douglas and Marice Kratz and attends Plains. Samuel Moyer, a senior nursing major from Harrisonburg, Va. He is the son of Stephen and Naomi Moyer and attends Bethany. Megan Nafziger, a sophomore nursing major from Mohnton, Pa. She is the daughter of Don and Rose Nafziger and attends Vincent. Benjamin Nyce, a senior liberal arts and kinesiology & sport studies double-major from Perkasie, Pa. He is the ons of Timothy and Teresa Nyce and attends Deep Run East. Matthew Nyce, a sophomore Spanish major from Perkasie, Pa. He is the son of Timothy and Teresa Nyce and attends Deep Run East. Konrad Swartz, a senior English and writing studies double-major from Spring City, Pa. He is the son of Timothy and Rachel Martin Swartz and attends Salford. Ryan Swartzendruber, a sophomore mathematics major from Sellersville, Pa. He is the son of Conrad and Sharon Swartzendruber and attends Plains. Aaron Wile, a first-year psychology major from Telford, Pa. He is the son of Daniel and Kristi Wile and attends Franconia. To qualify for the dean’s list a student must achieve a semester grade point average of at least 3.750 or above and complete at least 12 semester hours of credit. Eastern Mennonite University is a Christian liberal arts university of about 1,500 students, located in Virginia’s scenic Shenandoah Valley. EMU is guided by the peace principles of Mennonite Church USA, educating students to serve and lead in a global context through cross-cultural study and an interdisciplinary curriculum. Established in 1917, the university offers over 40 undergraduate majors and six graduate programs offering nine master’s degrees. Eastern Mennonite Seminary is part of the university, as is the Center for Justice and Peacebuilding. See more at: emu.edu/about.